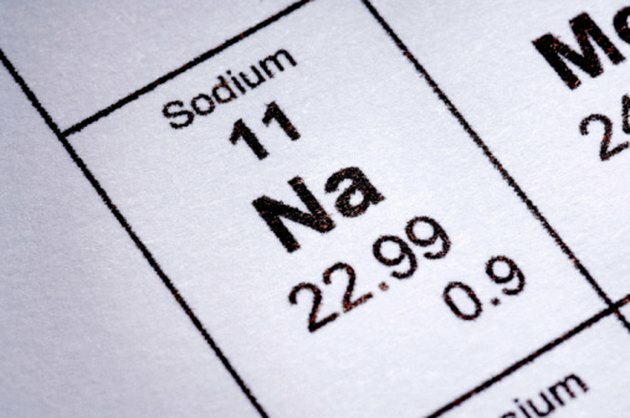 Sodium is a very important electrolyte in the blood; it helps maintain adequate blood volume. In the body, more sodium is outside the cells than inside, because the cell membranes are not freely permeable. Low levels of blood sodium can result in decreased kidney function, and larger losses of sodium can result in kidney failure. Kidney function depends on adequate blood volume and pressure. The concentration of sodium in the blood changes depending on the conditions affecting the body. When blood sodium is low, aldosterone -- a steriod hormone produced by the adrenal glands -- is released to act in the kidneys; in the kidneys, aldosterone increases sodium reabsorption, which results in the elevation of blood sodium. The intake of dietary sodium also helps restore normal sodium levels. When sodium is increased in the blood, blood volume and pressure also increase; as a result, more blood is filtered and more urine produced. The kidneys, like every organ in the body, require constant oxygen supply to function adequately. Oxygen is transported via the blood; therefore, blood flow must be maintained to ensure adequate oxygen supply to the kidneys. The pumping of the heart results in blood flow, but without adequate blood volume, the effectiveness of the heart will be compromised. Sodium is the most important electrolyte involved in the maintenance of blood volume; therefore, adequate levels of sodium in the blood are needed to maintain the supply of oxygen to the kidneys. If you have low sodium, you may experience a change in mental status, such as confusion, hallucination and reduced awareness. When blood sodium is very low, it may result in coma or extended unconsciousness. Other symptoms that may be associated with low blood sodium include tiredness, loss of appetite, nausea, vomiting, headaches, muscle weakness and cramps. A blood test can be done to evaluate the function of the kidneys; the blood is checked for levels of blood urea nitrogen, or BUN, and creatinine. When kidney function is reduced, BUN and creatinine are increased; the ratio of BUN to creatinine may also be useful in determining the cause of kidney dysfunction. The urine may also be analyzed for its composition; the urine is more concentrated when kidney function is reduced. Since increased sodium excretion by the kidneys can result in low blood sodium, examination of the urine for sodium concentration may be helpful as well.